Falafel recipe by Nadia at PakiRecipes.com. 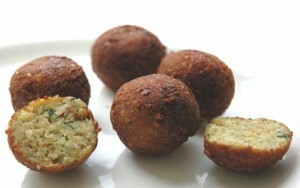 A traditional middle eastern, very filling vegetarian dish, perfect as a starter, main course or just a snack. Soak chanas in water one night before. Boil the chanas/chickpeas with salt until the chickpeas are 3/4 tender. Put all the above ingredients in chopper (except salt , egg) and chop them. Now add salt and egg in it. Make its shape however you want. Heat oil in pan and deep fry them on medium heat until they become golden brown. Serve hot with any kind of chutney or salad you like. Enjoy!! !